Each farmer's background is unique. Most have little personal experience with sophisticated accounting practices. Each farmer's goals are unique and constantly changing. Farmer-accessible education and training in accounting and financial management is both scarce and expensive. 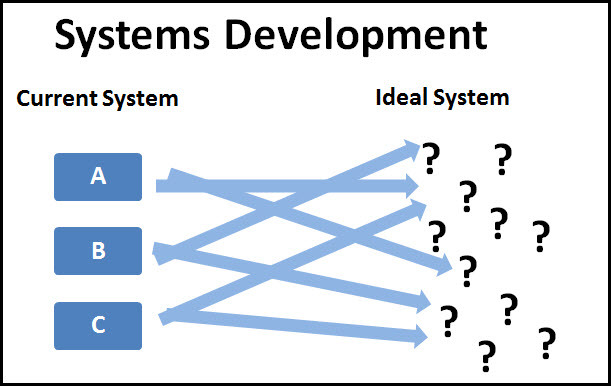 Systems Development can pinpoint where the farmer is today (A) and determine where he needs to go (B) But it also requires professional guidance and training to implement while providing no guarantees for ultimate success (see below). While based loosely on the concepts of systems development, Growth Path Accounting offers three significant benefits: a simpler process, faster adoption and reduced risks. Instead of forcing the farmer to select among an infinite combination of possibilities, he chooses between three predefined accounting systems. Since Growth Path Accounting encourages the farmer to begin at an accounting level he already understands as well as provides an organized framework for record-keeping, new computer users can get off to a much faster start. Finally, because a "growth path" is open between each of the three accounting methods, the possibilities of getting "stuck" in a program that is either inadequate or too complicated are virtually eliminated. (See below.) This flexibility in turn, makes the system selection process much less critical. The major caveat to this method is the software. Obviously, several options must be available within one program or family of programs. The "path" must be well-documented and procedures established to move the user from one module to another as the need arises. For farmers to move beyond "computerized checkbooks," both the fear of failure and lack of education hurdles must be crossed. 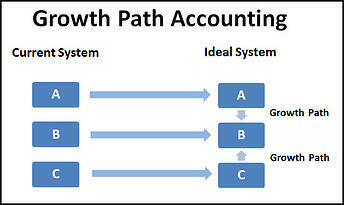 Both the Systems Development and Growth Path Accounting processes can provide tailored solutions to meet your needs. The first method depends on the judgment of a trained expert; the second is a "DIY" approach. We'll cover the specifics of the "growth path" procedures in the next issue.